Antwerp, a city and municipality in Belgium, lies on the River Scheldt, which is linked by the Westerschelde to the North Sea 55 miles (88 km) to its north. It is located in the largest estuary in western Europe, formed by the Scheldt, Meuse and Rhine Rivers. Antwerp, an integral part of an enormous harbor complex, is one of the world’s major seaports. Indeed, the Scheldt is the heart and soul of Antwerp, from which it derives its economic life and sense of identity. Antwerp has long been an important city in the nations of the Benelux both economically and culturally. During its "golden age" in the sixteenth century, Antwerp was one of the largest cities in Europe. It is today a city of contrasts, as is evidenced by its dualities: a practical seaport city of strong commerce and trade, it flourishes in arts and philosophy; its past is proudly displayed in its architecture and statuary while it strives to be a modern city; traditional and provincial, it is also more broadly European and cosmopolitan; a leading center of fashion design, it is also a religious city as a hub of Judaism and Christian seafaring missions. Antwerp had an artistic reputation in the seventeenth century, based on its school of painting, which included Rubens, and Van Dyck. After the Second World War, which earned it the dubious reputation of most-battered target, and the Holocaust, Antwerp became a center for Orthodox Jews. The city is noted for the fine houses of wealthy sixteenth century merchants, ornate churches, and for distinctive Antwerp lace. While Antwerp provides much for its citizens in the areas of arts, philosophy and commerce, its unemployment rate in 2006 was 16.72 percent. Its home nation of Belgium is ranked consistently high in the areas of human and economic development, however it cannot be judged successful until all citizens be able to attain a means of economic support. The name Antwerpen, in Dutch, means roughly "to throw a hand." According to folklore, a mythical giant called Antigoon exacted a toll from those crossing the river. Any who refused to pay would have a hand cut off and thrown into the River Scheldt. Eventually, a young hero named Brabo killed the giant, cut off the giant's hand, and flung it into the river. Another theory is that the name comes from the Latin antverpia, indicating land that forms by deposition in the inside curve of a river. Yet another theory is that the name derives from "anda" (at) and "werpum" (wharf). Antwerp is located on the right bank of the River Scheldt, which is linked by the Westerschelde to the North Sea 55 miles (88 kilometers) away. The topography of Antwerpen province is flat and veined with rivers. The Scheldt River, with the Meuse and the Rhine Rivers, forms the largest estuary in western Europe. Antwerp's total area was 80 square miles (204.51 square kilometers) in 2008. The city center is on the right bank of the River Scheldt. Sixteenth-century fortified walls surrounded the city until 1859, after which they were demolished to create broad avenues as a wider sweep of fortifications was built. After World War II, that outer wall was replaced by ring roads, which connect with national and international highways. Areas include: Zurenborg, an area in the southeast of the city that was developed between 1894 and 1906, and which features a high concentration of townhouses in Art Nouveau and other fin-de-siècle styles; Van Wesenbekestraat, the Chinatown of Antwerp; Meir, Antwerp's largest shopping street; Den Dam, an area in the north that was the location of old abbatoirs; and Zuid, the southern sector which is the cultural center of the city. Antwerp was inhabited in Gallo-Roman times, according to excavations carried out in the 1950s, which revealed pottery shards and fragments of glass from mid-second century to the end of the third century. Germanic Franks settled the area in the fourth century. Saint Amand evangelized the then fortified Merovingian Antwerp in the seventh century, and at the end of the tenth century, the Scheldt became the boundary of the Holy Roman Empire, and Antwerp became a margraviate, a border province facing the County of Flanders. Godfrey of Bouillon was for some years best known as marquis of Antwerp in the eleventh century, and in the twelfth century, Norbert of Xanten established a community of his Premonstratensian canons at Saint Michael’s Abbey at Caloes. 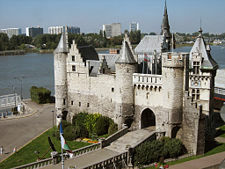 Antwerp was the headquarters of Edward III during his early negotiations with Jacob van Artevelde, and his son Lionel, the Earl of Cambridge, was born there in 1338. Around 1500, the Zwin, a substantial arm of the North Sea that stretched to Sluis, began to silt up, blocking canal navigation to Bruges. Bruges declined, and Antwerp, then part of the Duchy of Brabant, became important. Statue of Brabo and the giant's hand. Antwerp's "Golden Age" is tightly linked to the "Age of Exploration." At the end of the fifteenth century the foreign trading houses were transferred from Bruges, and Antwerp grew to become the second largest European city north of the Alps by 1560. Many foreign merchants were resident in the city. Guicciardini, the Venetian envoy, stated that hundreds of ships would pass in a day, and 2000 carts entered the city each week. Portuguese ships brought pepper and cinnamon. Without a long-distance merchant fleet, and governed by an oligarchy of banker-aristocrats forbidden to engage in trade, the economy of Antwerp was foreigner-controlled, which made the city very international, with merchants and traders from Venice, Ragusa, Spain and Portugal. Antwerp had a policy of toleration, which attracted a large Orthodox Jewish community. Antwerp was not a "free" city though, and was controlled from Brussels. Antwerp experienced three booms during its golden age. The first was based on the pepper market, a second was launched by American silver coming from Seville (ending with the bankruptcy of Spain in 1557), and a third boom was based on the textiles industry. The boom-and-bust cycles and inflationary cost-of-living squeezed less-skilled workers. The religious revolution of the Reformation erupted in violent riots in August 1566, as in other parts of the Netherlands. The regent Margaret, duchess of Parma, was swept aside when Philip II sent the Duke of Alba at the head of an army the following summer. The Eighty Years' War, which broke out in 1572, disrupted trade between Antwerp and the Spanish port of Bilbao. On November 4, 1576, in an event known as the Spanish Fury, Spanish soldiers plundered the city, killing 6000 citizens, burning 800 houses, and causing over two millions sterling of damage. The reason for the attack was that the Spanish soldiers, who were tired of fighting outnumbered against rebel troops, without a rest and without their salary, decided to "pay themselves" by looting Antwerp. Antwerp became the capital of the Dutch revolt, also known as the Eighty Years' War, from 1568, which was the revolt of the Seventeen Provinces in the Low Countries against the Spanish (Habsburg) Empire. In 1585, Alessandro Farnese, Duke of Parma and Piacenza, captured the city after a long siege and sent its Protestant citizens into exile. Antwerp's banking was controlled for a generation by Genoa and Amsterdam became the new trading center. Antwerp's wealth enabled patronage for artists, so that the city had an artistic reputation in the seventeenth century, based on its school of painting, which included Rubens, Sir Anthony Van Dyck, Jacob Jordaens, David Teniers the younger, (1610, d. 1690), the son of David Teniers, his father, and many others. Grote Markt (main square): open air cafés, City Hall and guildhouses in background. The Eighty Years' War ended with the Treaty of Münster in 1648, which recognized the independence of the United Provinces but stipulated that the Scheldt River should be closed to navigation. This destroyed Antwerp's trade. Antwerp had reached the lowest point in 1800, and its population had sunk under 40,000, when Napoleon, realizing its strategic importance, relaxed restrictions on navigation and assigned funds for the construction of two docks and a mole. This impediment remained until 1863. Belgium formed part of the Kingdom of the United Netherlands from 1815 to 1830, when, during the Belgian Revolution of 1830, Belgian insurgents captured Antwerp. 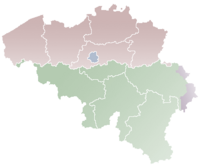 An independent, Roman Catholic and neutral Belgium was established on October 4, 1830. Nevertheless, the citadel continued to be held by a Dutch garrison under General David Hendrik Chassé until December 1832, when Chassé surrendered. During World War I, Antwerp became the fallback point of the Belgian Army after the defeat at Liège in August 1914. During World War II Nazi Germany occupied Antwerp in May 1940, and the British 11th Armoured Division liberated the city on September 4, 1944. After this, the Germans attempted to destroy the Port of Antwerp, which was used by the Allies to bring new material ashore. Thousands of V-1 and V-2 missiles battered the city, more than any other target during the entire war, but the attack did not destroy the port. The severely damaged city was rebuilt after the war in a modern style. After the war, Antwerp, which had already had a sizable Jewish population before the war, once again became a major European center of Haredi (and particularly Hasidic) Orthodox Judaism. Belgium is a federal parliamentary democracy under a constitutional monarchy, and Antwerp is the capital of Antwerp province in Flanders, one of Belgium's three regions. 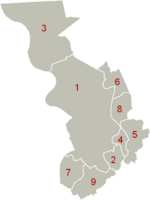 The municipality is divided into nine districts: Antwerp (district), Berchem, Berendrecht-Zandvliet-Lillo, Borgerhout, Deurne, Ekeren, Hoboken, Merksem, and Wilrijk. A mayor (burgomaster), a board of aldermen, and an elected city council govern the municipality of Antwerp. The mayor is a member of the elected council, and is recommended by them but nominated by the King of Belgium. Each alderman manages a specified department. A governor, appointed by the king, a provincial council elected every four years, and a board of deputies, govern the province of Antwerp out of the city Antwerp. Antwerp's sea port was the seventeenth largest (by tonnage) port in the world in 2005 and second only to Rotterdam in Europe, according to the American Association of Port Authorities. Antwerp's docklands, with five oil refineries, are home to a massive concentration of petrochemical industries, second only to the cluster in Houston, Texas. Power generation is also an important activity, with four nuclear power plants at Doel, a conventional power station in Kallo, as well as several smaller combined cycle plants. The old Belgian bluestone quays bordering the Scheldt for a distance of 3.5 miles have been retained for their sentimental value and are used by cruise liners and short-sea shipping. Antwerp's other great mainstay is the diamond trade. The city has four diamond bourses—one for boart industrial use and three for gem quality goods. Since the Second World War families of the large Hasidic Jewish community have dominated Antwerp's diamond trading industry although the last two decades have seen Indian and Armenian traders become increasingly important. Antwerp is a rising fashion city, and has produced designers such as the Antwerp Six. The city has a cult status in the fashion world, due to the Royal Academy of Fine Arts, one of the most important fashion academies in Europe. It has served as the learning center for a large number of Belgian fashion designers. A motorway bypass, known locally as the "Ring," encircles much of the city center, and offers motorway connections to other cities. The banks of the Scheldt are linked by three road tunnels with a fourth high volume highway link, involving a long viaduct and bridge, in the tendering stage in 2008. Antwerp has two major railway stations: Central, which is a monument in itself, and Berchem. The city has a web of tram and bus lines. The tram network has 11 lines, of which the underground section is called the "premetro" and includes a tunnel under the river. Antwerp International Airport is in the district of Deurne. Brussels Airport is about 28 miles (45km) from the city of Antwerp, and connects the city worldwide. The airport is connected by bus and by train to the city center of Antwerp. The Onze-Lieve-Vrouwekathedraal (Cathedral of our Lady) at the Groenplaats is the highest cathedral in the Low Countries and home to several triptychs by Baroque painter Rubens. It remains the tallest building in the city. 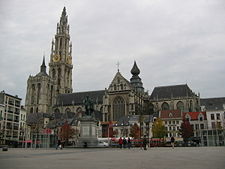 Antwerp's total population was 461,496 in 2006. The population density of 2257 inhabitants per square kilometer is one of the highest in Europe, after that of the Netherlands. Belgium is ethnically split between its Fleming majority, which comprises 58 percent of the population, its Walloonian minority, 31 percent, and about 73,000 Germans. The other 11 percent consists mostly of Europeans, Turks, Moroccans and Algerians. 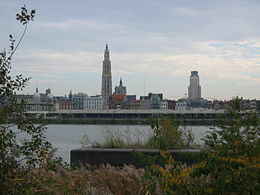 Antwerp is located in the northern Flemish part of the country. Informally, most Antverpians daily speak "Antverpian," a dialect that Dutch-speakers know as distinctive from other Brabantic dialects through its typical vowel pronunciations. The Echt Antwaarps Teater ('Authentic Antverpian Theatre') brings the dialect on stage. Dutch is an official language of Belgium, spoken by 60 percent of the population. French, another official language, is spoken by 40 percent, German (official) less than 1 percent, legally bilingual (Dutch and French). About 75 percent of the population are Roman Catholic, while the remaining 25 percent are classified as "other" and includes Protestants. After the Holocaust and the destruction of its many semi-assimilated Jews, Antwerp became a center for Orthodox Jews, with about 20,000 Haredi Jews, mostly Hasidic, living there in 2008. The city has three official Jewish Congregations, and an extensive network of synagogues, shops, schools and organizations. A number of Christian missions to seafarers are based in Antwerp, notably on the Italiëlei. These include the British & International Sailors’ Society, the Finnish Seamen's Mission, the Norwegian Sjømannskirken and the Apostleship of the Sea. They provide cafeterias, cultural and social activities as well as religious services. The University of Antwerp was founded in 2003 after the merger of the three universities that were previously known as RUCA (State University Centre Antwerp), UFSIA (University Faculties Saint Ignatius Antwerp) and UIA (University Institution Antwerp). The University of Antwerp has approximately 9000 students, which makes it the third largest university in Flanders. Other educational institutions include: the Institute of Tropical Medicine, the College of Antwerp, Lessius College, Plantijn College, Karel de Grote College, the Antwerp Maritime, Antwerp International School, and the Higher Institute for Fine Arts. 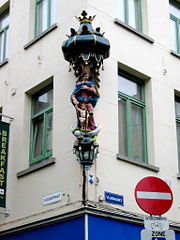 One of the many Marian statues which feature on Antwerp street corners. The Cathedral of Our Lady, which was begun in the fourteenth century and finished in 1518, and has four works by Rubens—"The Descent from the Cross," "The Elevation of the Cross," "The Resurrection of Christ" and "The Assumption"
The church, named for Saint James, which is more ornate than the cathedral, and contains the tomb of Rubens. The church of Saint Paul, which has a beautiful baroque interior, and is a few hundred yards north of the Grote Markt. The Plantin-Moretus Museum, which preserves the house of the influential Renaissance humanist, book printer and publisher Christoffel Plantijn (1520-1589) and his successor Jan Moretus (1543–1610). The Boerentoren (Farmers' Tower) or KBC Tower, a 26-storey building built in 1932, which is the oldest skyscraper in Europe. The Royal Museum of Fine Arts, close to the southern quays, which has a collection of old masters (Rubens, Van Dyck, Titian) and the leading Dutch masters. The exchange or Bourse, which is one of the earliest institutions in Europe with that title, and was built in 1872. The law courts, designed by the Richard Rogers Partnership, Arup and VK Studio, and opened by King Albert in April 2006, features courtrooms on top of six fingers that radiate from an airy central hall, and are surmounted by spires which provide north light and resemble the sails of barges on the nearby River Scheldt. The building's highest "sail" is 167 feet (51 meters) high, has a floor area of 77,000 square meters, and cost €130m. The city is known for Antwerp lace, which is a bobbin lace distinguished by stylized flower pot motifs on a six-point star ground. It originated in Antwerp, where in the seventeenth century an estimated 50 percent of the population of the city was involved in lace making. Antwerp lace is also known, from its familiar repeated motif, as "Pot Lace"—in Flemish Pottenkant or Potten Kant. It is sometimes said that the flowers were a depiction of the Annunciation lilies; however, the flowers were not limited to lilies. This page was last modified on 7 April 2016, at 19:10.